Clean Beach Coalition puts out both waste and recycling bins! 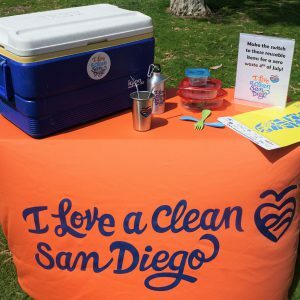 The San Diego Clean Beach Coalition (SDCBC) is lead by I Love A Clean San Diego, Free PB, and the City of San Diego Parks and Recreation. With the support of local businesses, the SDCBC aims to maintain the health, beauty, and safety of our public beaches and bays for everyone to enjoy! During busy summer holidays, San Diego’s beaches and bays overflow with local and out-of-town visitors coming to enjoy the beautiful views and perfect weather. With the influx of beachgoers, our permanent trash receptacles are overwhelmed by the additional waste, which can lead to debris littering our beaches and oceans. 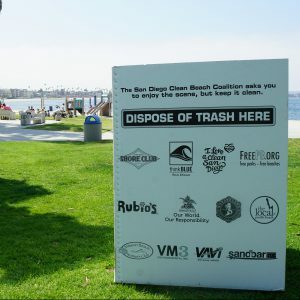 Each summer, the Clean Beach Coalition places temporary waste and recycling bins along some of SD’s busiest beaches and bays over holiday weekends to combat this issue! 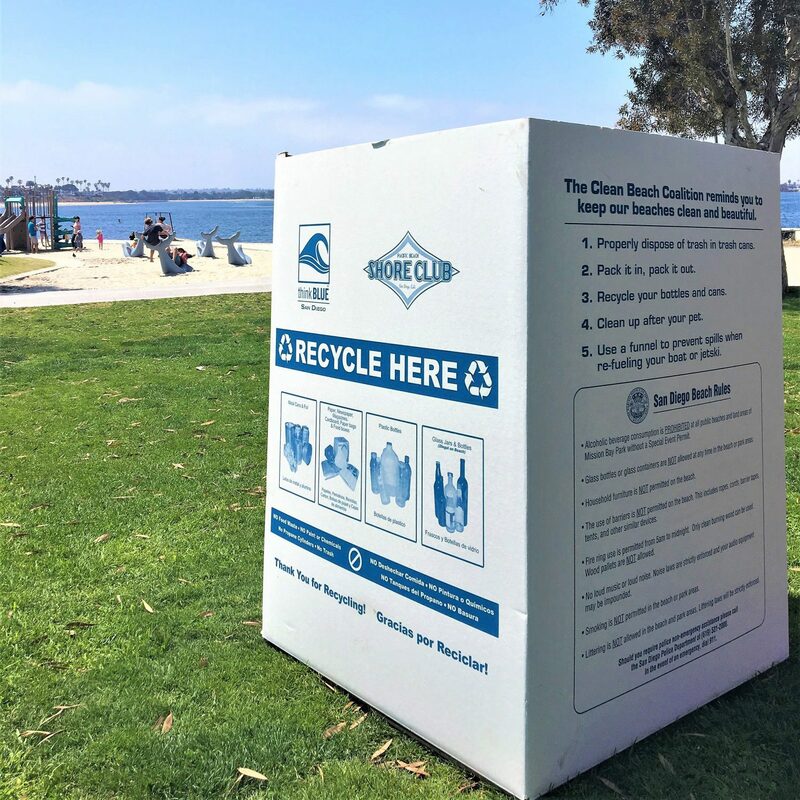 CBC Bins are placed along Pacific Beach, Mission Beach, Mission Bay, and Ocean Beach! Over the past decade, the Clean Beach Coalition has kept 3.5 million pounds of trash off the beach and out of the ocean. This past year, over 61,000 pounds of debris were collected during the summer holiday weekends. With the support of Think Blue San Diego, PB Shore Club, FreePB, and many more, SDCBC aims to educate beachgoers about the harms of beach and marine litter and how we can lessen our impact by swapping out single-use, disposable products with reusable alternatives. Before you hit the beach, ready your reusables to decrease the amount you have to dispose! Anyone can help keep our beaches clean! A simple way to make a huge difference is opting for reusable items in place of disposable, single-use plastics. SDCBC recommends using a hard plastic cooler or insulated bag as an alternative to Styrofoam coolers. Pack a refillable water bottle instead of single-use plastic bottles. Also, eliminate the need for sandwich bags and food wrappers by shopping in bulk and packing reusable food storage containers. Don’t forget to pack out what you pack in! Bring any reusables home with you to leave the coast in the best possible condition after visiting. 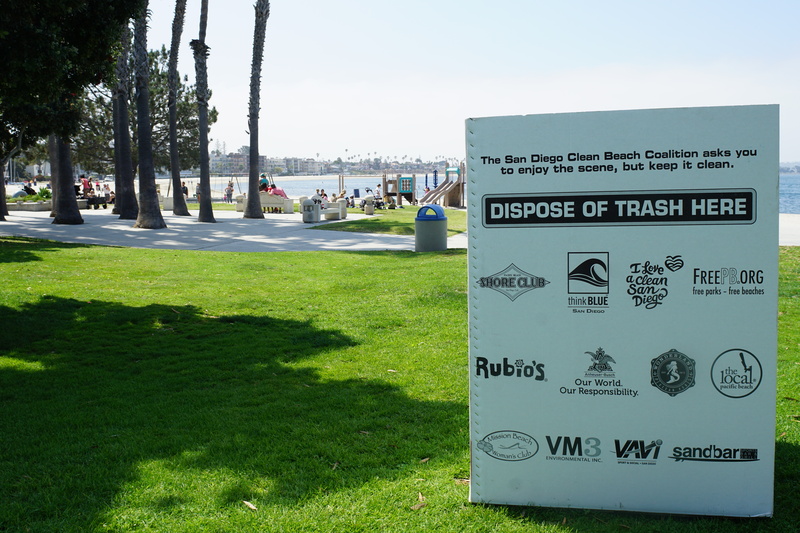 Thank you to all of our Clean Beach Coalition Sponsors! The efforts of the Clean Beach Coalition would not be possible without the generous support of local businesses, organizations, and individuals. Thank you so much to all of our sponsors and partners!